It’s hard to believe that in one month we will be celebrating Stella’s first birthday! Time flies when you’re having fun for sure! Little Miss is learning new things everyday. She likes to climb and go everywhere that she is not supposed to go, always looking over her shoulder to make sure we’re watching. She says a few words too, like momma, dada, uh-oh, and aye, yi, yi! Poppy even swears he heard her say I Love You! I know, she’s a genius! She hasn’t started walking on her own yet, but she is so close! That’s when the real fun will begin! Last night was Family and Community Night at Felicia’s school. She is always so excited to share some of the things she is learning, so I thought I would share a few pictures from the event. She made sure we saw everything…twice! Watering the plants each time around! It was a good time. She is very proud of the work she has done and we are too! The grass sure feels funny on my toes. What are these cool new toys? I can bang them together and make noise. I wonder if mom will notice that I am about to climb these steps? Wow, look at the pretty pictures! We don’t have these on the inside! My girls love to paint on anything they can and that includes the sidewalks surrounding our house. The recipe for this paint couldn’t be simpler: 1/4 cup cornstarch mixed with 1/4 cup of water and some food coloring. Super simple and tons of fun! 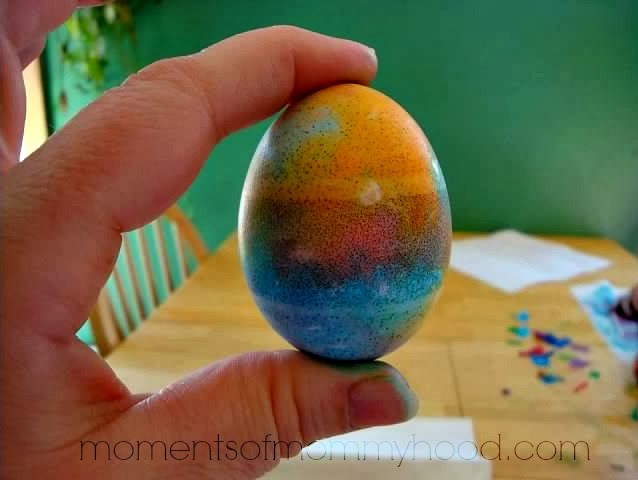 When the paint dries it looks just like it would if it was drawn with sidewalk chalk and it washes away with water! Friday afternoon the girls and I headed to the church to dye eggs for the big Easter egg hunt we were having on Saturday. 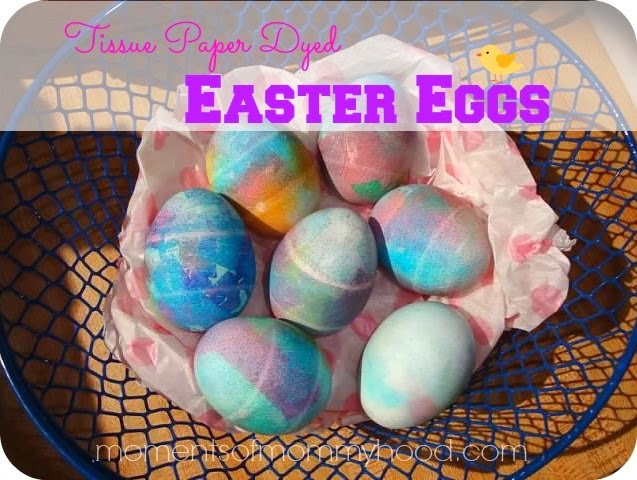 I do believe they had just as much fun dyeing the eggs as they did hunting them the next day. We were very lucky that the rain held off on Saturday and the hunt was a big success. Easter Sunday was a little extra special for the Adams’ family this year. It was the day of Stella’s baptism! After church, we gathered for a delicious lunch with way too many desserts and then, we had a slightly soggy egg hunt, but the kids didn’t mind! Today was our last day of Spring break and mother nature definitely saved the best for last. It was warm and summerlike and the perfect day for popsicles on the front porch. Yes, it’s true, Spring break is coming to an end, but after today, we are definitely looking forward to summer break! Wishing you a very Happy Easter! May all your eggs be prize eggs! Yesterday was candy making day for our annual Easter Egg hunt at Church. Each year, the kids gather together to create their chocolate treasures and boy, do the mean business! Apparently there is no such thing as “too much chocolate” when Felicia is filling the molds. ..and “binkies” come in handy too. Especially when the temptation of licking chocolaty fingers is pretty hard to resist. I guess we’ll call it a success! The candy making was completed and the kitchen returned to its normal, non-chocolate covered way. 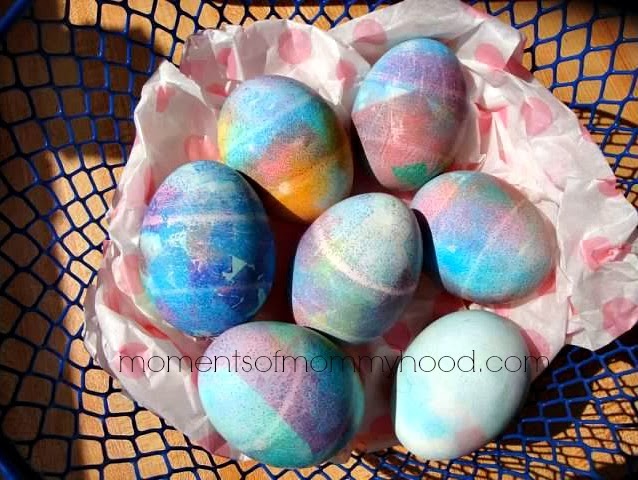 Our next adventure…egg dyeing later this week! We can’t wait! I know I said last week that I was going to be getting back in the swing of things, but I honestly have been even more busy than usual. Not that I’m complaining, because I would rather be busy with my family chaos than doing anything else! 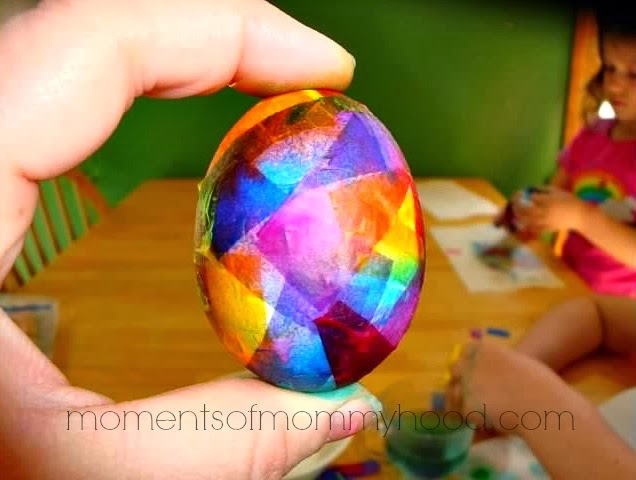 :) We’ll be doing some Easter crafting starting on Monday so I will have a few fun things to share. Exactly How Would A Government Shutdown Affect Military Families? My friend Jeannie can tell you! Please read her post about life in a government shutdown as a military family. I find the whole situation appalling! Check it out here. They say April showers bring May flowers, right? Well I sure hope so because we have definitely had our share of showers the past two days. So, to honor our spring showers, we made our very own paper plate umbrellas! First, color a paper plate any way that you like and then cut it in half. After it’s cut in half, cut a slit in each piece and fit the two halves together. Next you need to add a handle made from construction paper. Hang a few raindrops from your umbrella and add a string to hang it up.